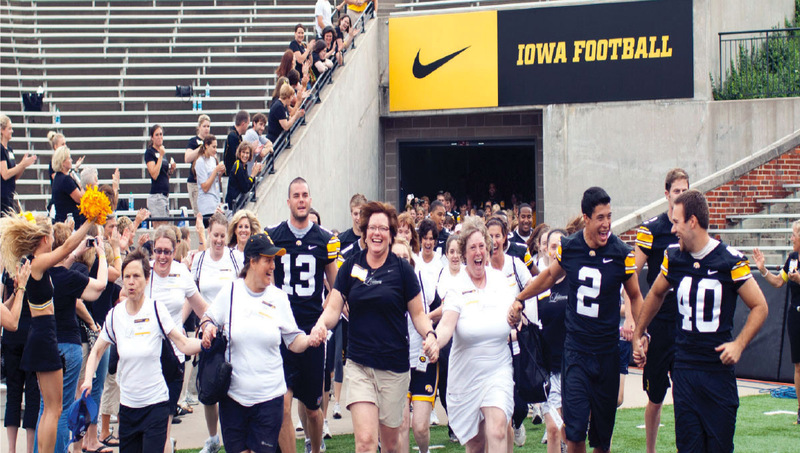 From a corner of Kinnick Stadium—at the start of the first-ever University of Iowa Ladies Football Academy this past June— some 300 women ran out onto the field, hands clasped with Hawkeye football players and kid-in-a-candy-store smiles on their faces. With Metallica’s “Enter Sandman” blaring from the sound system and video montages playing on the jumbo screen, these ladies were made to feel just like Saturday football superstars. It was just as Ferentz had imagined, maybe even better. A day for women to learn the basics of football for a good cause, the academy raised $150,000 through registration fees and fund-raising to benefit patients and families at the UI Children’s Hospital. An idea first considered years ago by Mary’s husband and head football coach, Kirk Ferentz, the event finally came to fruition this summer. During the six-hour football camp at Kinnick Stadium, participants performed drills and enjoyed lighthearted camaraderie with Hawkeye football coaches and players. Other perks included a tour of the black-and-gold home locker room and an awards presentation and postgame wrap-up inside the indoor practice bubble. Ferentz describes the atmosphere as joyful, relaxed, and fun. Other colleges have hosted ladies football academies for some time and Ferentz is excited for what the future holds for the Iowa tradition. Next year’s Iowa Ladies Football Academy is already scheduled for June 9. Over the next five years, she hopes the academy and Iowa football will raise $1 million toward the development of the new children’s hospital that will enhance care for the state’s youngest, most vulnerable patients.